CMC Markets analyst Margaret Yang said yesterday's lower trading value suggests that "investors are waiting on the sidelines, looking to upcoming earnings of the big US banks". Yesterday's trading saw investors moving to a number of defensive plays like real estate investment trusts, as well as telco and transport counters, said Mr Brandon Leu, UOB Kay Hian's vice-president of equities and financial products. Among non-STI counters, Asian Pay Television Trust was the bourse's most traded and one of the day's main gainers. The business trust advanced 21.7 per cent to 15.7 cents on 50.1 million units traded. Another active counter was luxury timepiece retailer The Hour Glass, which closed flat at 76 cents with 9.9 million shares traded. 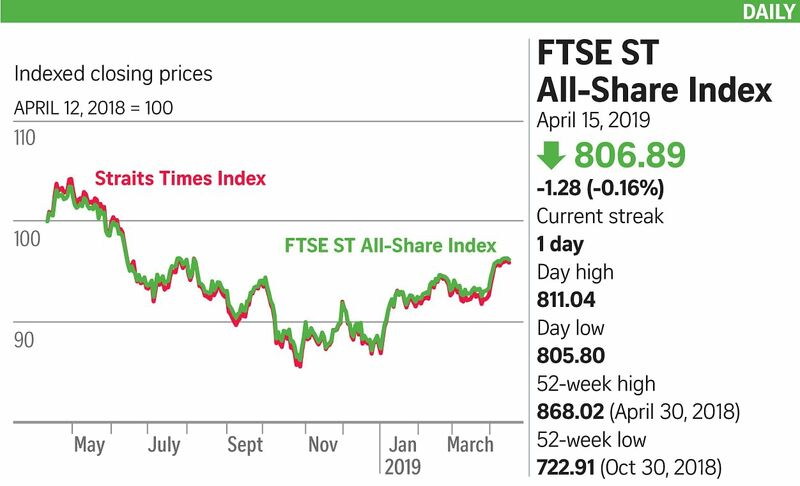 The bulk of the volume was a 9.72-million-share married trade at 71 cents, a 6.5 per cent discount to yesterday's closing price.